Underhill's Pattern Master is part of their Proline™ Gold Series hose nozzles. 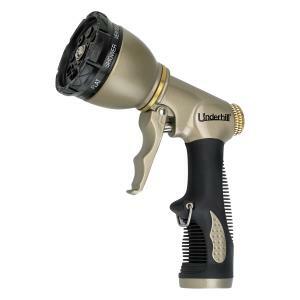 Nozzle has eight selectable spray patterns and smooth trigger operation. The durable machined brass and stainless steel, powder-coated finish with rubber comfort grip make this nozzle perfect for all your lawn and garden needs. With Underhill products, you get professional quality with competitive pricing.